"Mr. Hamid reaffirms his place as one of his generation's most inventive and gifted writers." Michiko Kakutani, "The New York Times"
"Marvelous and moving." "TIME Magazine"
From the internationally bestselling author of "The Reluctant Fundamentalist," theboldly imagined tale of a poor boy's quest for wealth and love . . .
His first two novels established Mohsin Hamid as a radically inventive storyteller with his finger on the world's pulse. "How to Get Filthy Rich in Rising Asia" meets that reputation and exceeds it. The astonishing and riveting tale of a man's journey from impoverished rural boy to corporate tycoon, it steals its shape from the business self-help books devoured by ambitious youths all over rising Asia. It follows its nameless hero to the sprawling metropolis where he begins to amass an empire built on thatmost fluid, and increasingly scarce, of goods: water. Yet his heart remains set on something else, on the pretty girl whose star rises along with his, their paths crossing and recrossing, a lifelong affair sparked and snuffed and sparked again by the forces that careen their fates along. 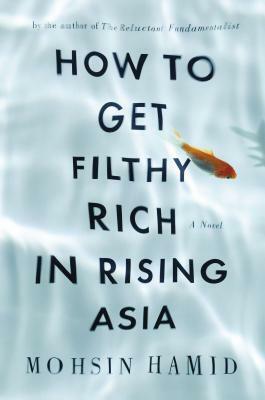 "How to Get Filthy Rich in Rising Asia "is a striking slice of contemporary life at a time of crushing upheaval. Romantic without being sentimental, political without being didactic, and spiritual without being religious, it brings an unflinching gaze to the violence and hope it depicts. And it creates two unforgettable characters who find moments of transcendent intimacy in the midst of shattering change. Mohsin Hamid's first novel, "Moth Smoke," won theBetty Trask Award and was a finalist for the PEN/Hemingway Prize. His second, "The Reluctant Fundamentalist," a bestseller in the United States and abroad, was shortlisted for the "Man Booker Prize." Hamid contributes to "Time," "The New York Times," and "The Washington Post," among others. He lives in Lahore, Pakistan."